To be a champion it takes practice, dedication, and as you can see in the face of Hingham’s Andrew Bolze, plenty of effort. Couitt opened the major meet season with a win, clearing 6 feet-6 inches at the Coaches Elite. He hit the same mark to win Division 3, before raising the bar. He jumped 6-9 at New Englands, and a personal best 6-10 at All-States. Beckwith ended the indoor season with two records to his name: the Hockomock mark at 58-feet and school record at 59-6. The 2012 New England outdoor champion followed up with Hockomock, Division 2 (57-8.75), and All-State (59-5.5) titles. No one could top Bolze this season. The Junior took top prize at the Division 3 meet (35.87), All-States (34.70), and the New England championship (34.79). The junior’s New England title broke the school record by 2 seconds and was the fasted time in Massachusetts since 1984. 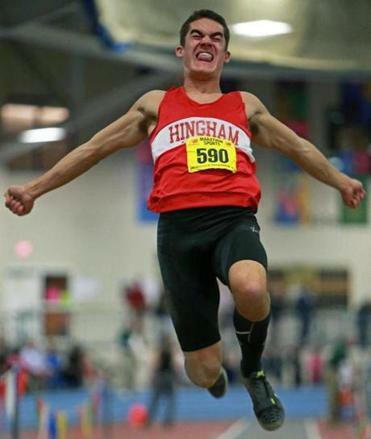 Darrow’s jump of 22 feet-4 inches helped him capture the Division 1 state title. Darrow closed the season with longer jumps at All-States (22-5.5) and New Englands (22-9), earning second place in both meets. The senior also plays football and soccer. After a title filled cross-country season, Green was back for more. At the Division 1 state meet he finished second in 9:28.85. The senior shaved seconds off to win the All-State title, crossing in a personal best 9:21.48 to repeat as champion. After a second place finish at the MIAA Division 2 meet (6.69), Hayes took the All-State title in 6.46 for the second consecutive year. The senior is an honor roll student and a member of the Rebels’ football team. In a first place finished at the Division 1 meet, Kerber broke the school record with a time of 2:29.83. At the All-State meet, the junior posted a 2:30.21 for first place. Additionally, he anchored the 4-by-400 at New Englands, helping the Warriors finish first in a school record 3:24.49. O’Donnell captured first place at the Division 1 meet and then repeated the following week at All-States (4:15.81). He placed 10th at the New Balance Nationals (4:14.88), which is a school record. The senior will continue at the University of Connecticut. Park only lost two races this season, when he finished second at the Coaches Elite meet in 7.60 seconds. A 7.99 in the 60 meter hurdle dash at the New Balance National meet was good for 5th after winning Division 1 (7.66), All-States (7.57), and New Englands (7.4). Finishing in 1:21.97 at the Division 1 meet, Rolim captured his fourth and final state title. He won the Coaches Elite in 1:22.18. He grabbed his third All-State title with a 1:21.10 finish to close the indoor season. His 2012 Massachusetts state record (1:19.94) went unbroken. The Falcons were anchored by their relay team of Anderson, Kirby, Kozlowski, and Velez. They opened the season with a win at the Coaches Relays in 1:32.03. The quartet grabbed first place at the Division 1 meet in 1:31.49. At the All-State meet, in which the Falcons finished third as a team, they posted a 1:31.31. Kirby is the lone senior and plans to attend Harvard next year. Usoff, Doelp, Cox, and Sommers’s first place finish in 3:25.11 at the Division 1 state meet earned the Colonials third place in the team standings. At All-States, the four seniors ran a 3:25.13 for the win. At the New Balance Nationals, they earned second in the Emerging Elite 4-by-400 with a season best time of 3:23.24. Sommers finished second (35.14) at the Division 1 meet, third at All-States (35.15), and fifth at New Englands (35.70) in the 300 meter run. Cox took third in the 1,000 at the Division 1 (2:30.69) and All-State (2:32.33) meets. The Red Raiders’ quartet of Coppinger, Whitney, Kalenoski, and Richards won the All-State title with a time of 7:57.90. At the Division 1 meet, the four ran a an 8:01.13 to win the meet. Coppinger also runs the the 2-mile and finished second at All-States and third at New Englands. He also holds the school record in the mile. Kalenoski will continue running next year at UMass-Lowell. Coppinger, Kalenoski, and Richards were part of the distance medley team that placed eighth at the New Balance Nationals. The Falcons use a co-coaching system, but technically Prince oversees his alma mater’s (class of 1988) boys’ team. He led them to an undefeated (4-0) Greater Boston League season. Prince won this honor in 1999 and is in his 19th year of coaching. Croft coached the Rockets to two meet titles this season. They took home the Middlesex League Liberty championship and the Division 2 state title. After 42 years of coaching, this honor is one of many Coach of the Year recognitions. In his 30th year of coaching, Norris led the Falcons to a undefeated Northeast Conference South finish (7-0). His team finished second at the Division 3 Coaches Relays. Between track and cross-country, he has been named NEC Coach of the Year 17 times. With an undefeated season in the Dual County League Small at 7-0, Montrose earned his first coaching honors in his seventh year. The Wildcats took home third place at the Division 4 meet. They opened the season by winning the Division 4 Coaches Relays. Atlantic Coast — Dennis-Yarmouth: Keith Barnatchez, Dan Field, Hiroto Watanbe. Falmouth: Carmen Cilfone, Devon Green. Marshfield: Brendan Doherty, Bennett Ford, Matt Meehan, Justin Patterson, Pat Sheridan, Mike Tautiva. Norwell: Charley Petit, Owen Wiggins. Plymouth North: Ian Allen, Mike Bambrick, Scott Dickson. Plymouth South: Colin McHugh. Sandwich: James Wegman. Bay State — Brookline: Matthew Brown, Sam Burrington, Jesse Fajnzylber, Aaron Klein. Dedham: Jack McCorrisan. Milton: Chivinskee Milcent, Kareem Patterson. Natick: Mike Maichen. Needham: Dan Alpert, Adrian Amaya, Tyler Hagen. Newton North: Nick Fofana, Ryan Lucken, Gabe Montague, David Oluwadara, Ben Porter, Carl Whitham. Norwood: Lonnie Garrison, Jason Matovu. Walpole: P.J. Hayes, Connor McCarthy. Wellesley: Dan Palladino. Weymouth: Tyler O’Brien, Nolan Parsley. Big Three — Durfee: Matt Baker, Spencer Borden, Jayden Silva, Nyrel Stroup, Keith Worsley. New Bedford: Brennan Costa, Tito Fernandes, Irvin Johnson, Justin Medeiros. Boston City — Brighton: Damian Robinson. Charlestown: Marquel Wade-Mosley. East Boston: Redouane Laalioui, Bernard Xhullima. O’Bryant: Patrick Powell. South Boston: Ewoe Amedoadzi, Hakine Walcott. West Roxbury: Bernardo Cruceta. Cape Ann — Ipswich: Robbie Fay. Newburyport: Nick Carleo, Jared Healey, James Nutter, Steve Preston, Joe Santo, Sawyer Updike. North Reading: John Braga, Cameron Hastings, Bradley Zackular. Dual County — Acton-Boxborough: Tim Cox, Andrew Doelp, Greg LaBoe, Max Rasmussen, Brian Sommers, William Tejeda, Nick Usoff, Jimmy Wang, Henry Zhou. Bedford: Samuel Bradford. Boston Latin: Malik Anderson, Kevin Chen, Anthony Cheung, Sekou Stuppard, Mike Ward. Concord-Carlisle: Timothy Blaides, Brian Rich. Lincoln-Sudbury: Nick Ackley, Nick Adams, Ben Colello, Devon Fitzpatrick, Luke Goodrich, Ryan Honens, Josh Kerber, Nick Santangelo. Newton South: Ben Cooper, Joe Hickey, Ryan Kim, Marini Lopci, Jung Park, Ray Park, Allen Shiu. Waltham: Brendan Bonadio, Andrew Brenner, Angelo Cotoni, Roger LaCroix, Roger Sargavakian. Wayland: Nick Ng. Westford: Qadir Barnard-Pratt, Tim Breen, Andrew Dunne, Andrew Gauthier, Jared Molnar, Nick Sciuto. Weston: Josh Breneville, Mathew Herzig, Geoffrey Pendergast, Christian Rougeau, Craig Shytle, Kenneth Tsui. Eastern Athletic — Bishop Feehan: Henry Dodge, Evan Grandfield, Kehma Johnson, Bill Ward. Bishop Stang: Zack Mello, Tanner Picklus. Coyle & Cassidy: Paul Lapre. East Bridgewater: Nate Augustin, Brandon Evora-Rosa, James Shea, Tyler Zentz. Mashpee: Romeo Gray. Somerset Berkley: Adam Couitt, Michael Raposo, Nathan Rebello. Greater Boston — Cambridge: Esu Alemseged, Shaquille Anderson, Rafael Guzman Jr., Alexander Kirby, Sean Phillips, Michael Scarlett, Sam Stubbs, DeShaun Velez. Everett: Hieu Vo-Tran. Malden: Kelly Desane, Franklin Huynh, David Kibazo, Gutemberg Santos, Tyler Williams. Medford: Nate Clement, Patrick Coughlin, Conner McGovern. Somerville: Marcello Brociner, Anderson Jupiter, Kevin Ma, Andre Rolim. Middlesex — Arlington: Dan McDonald Meteer, Antonio Xelhua. Belmont: Lucas Ribeiro, Chris Sandvik. Burlington: Alex Alessi, Adam Bonfilio, Paul Hogan, Ahmad Osman. Lexington: Nathaniel Adams, Felix Cancre, Felix Chung, Dan Finch, Ethan Isaacson, Ben Jacobsen, Ricardo Job-Reese, David Johnston, Arnold Joseph. Melrose: Dino Avdagic, Christian Gentile, Shane McKinley. Reading: Tristan Barros, Matt Dynan, Rob Federico, Peter Fodera, JD Greenfield, Justin Halley, Aaron LaLecheur, Ryan Maney, Dylan Swaebe. Stoneham: Alex Brown, Austin Bryan, Alec Kheboian, Tyler Malone, Jimmy O’Brien. Wakefield: Jackson Gallagher, Jared Geller, Aaron Lucci, Shane Nelson. Watertown: Alec Holland, Pat Lally. Wilmington: Erik Alatalo, Pat Barry, Colin Chase, Steve Halas, Eli Jennings, Andrew Sears. Winchester: Pat Franco, Brian Fratto. Woburn: Dylan Crowley, Max Deulofeu, Preston Gordon, Chris Jewett, Anthony Nguyen, Kyle Sullivan. Northeastern — Beverly: Harry Brown, Alex Greco, Dylan Perry, Campbell Wood. Danvers: James Bailey, Ryan Levesque, Joe Manson, Drew Piazza, Connor Rollins, John Thomas. Gloucester: Matt Carpenter, Everest Crawford, Jacob Holscher, Noah Mondello, Mike Sheehan. Lynn Classical: George Clark. Lynn English: Alex Bonitto, Alex Orterga. Marblehead: Josh Beloff, Conrad Rousseau. Peabody: Ben Baar, Chris Cedullo, Chris Cennani, James Christopher, Riley Dowd, Tom Drover, Drew Fossa, Rich Fournier, Alex Marcus, Connor Wolf. Revere: Jonny Lopes, Tarik Maddrey, Omar Morales, Zach Primo, Joe Ritchie, Bobby Rose, Karim Sahila. Salem: Jonathan Crimble, Aaron Palmer, Tim Ryan, Ben Sattiewhite, Taran Wigfal. Saugus: Kevin Powers. Swampscott: Zach Blonder, Peter Hale, Declan McClung, Robert Seymour. Patriot — Hingham: Andrew Bolze, Duncan Burleigh, Jake Hirtle, Bill Lumbert, Chris McDowell, Nick Neilsen, Aidan Ryan. Middleborough: Tyler Daschke, Wayne Montrond, Kenny Schofield. Pembroke: Pat Cunningham, Christian Stafford, William Stafford, Lucas Tocher, John Valeri, Davis Vasconcellos. Scituate: Jack Kahrs, Nick Walker. Silver Lake: Matthew Calabro, Derik Noland. Whitman-Hanson: Nick Haley. South Coast — Apponequet: Dylan Demorenville. Case: Nick DeNardo. Dighton-Rehoboth: Ty Enos. Greater New Bedford: Simeon Bailey, Kurtis Dreher. Old Rochester: Dan Donoghue, Nick Pacheco, Mike Wyman. Seekonk: Nate Robitaille. Tri-County — Archbishop Williams: Trenton Garlington. Arlington Catholic: Satish Reginald. Austin Prep: Joseph Luongo. Bishop Fenwick: Patrick Corcoran, Daniel Deschenes, Charlie Maistrellis, Bryan Mendes, Eric Razney, Nick Tambini. BC High: William Briggs, Atiba Frazer Nichols, Jordan Samuels, Osaevbie Woghiren. Brockton: John Burns, Leon Edwards, Fedrick Finjap, Jacob Hume, Treavor Korli, Aaron Williams. Cardinal Spellman: Ian Chester, Tanguy Dauphin, Matt Norton, Pat O’Donnell, Anthony Siracusa. Cathedral: Derek Welcome. Marian: Nick Seymour. St. John’s Prep: David Roy. St. John’s (Shrewsbury): Alex Couture, Alex Crowley, Ryan Dix, Jackson Ennis, Jonathan Green, Harry Maloy, Greg Moschella, Connor Murphy, Dylan Paddock. St. Mary’s: Justin O’Blenes. Xaverian: Kyle Darrow, Robert Marcantonio, Dana Pagliuca, Greg Petrucci, John Wheeler, Tyler Wolfe.